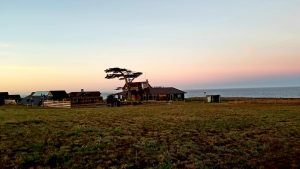 The Inn at Newport Ranch, located on the craggy Pacific coastline near Fort Bragg, CA in Mendocino County is perhaps the ideal location to explore California’s wild northern coast. Simultaneously remote and accessible, this unique boutique adventure lodge boasts miles of uninterrupted oceanfront vistas, upscale dining, as well as an abundance of nature and adventure tours. The Inn was recognized on the 2018 Andrew Harper Grand Award Winner list, a distinction given each year to only a few lodges in the entire world. Guests come from far and near to escape the stress of everyday life. The Inn at Newport Ranch provides the ideal setting to unwind and relax, putting one in touch with the solace of both nature and their own souls. 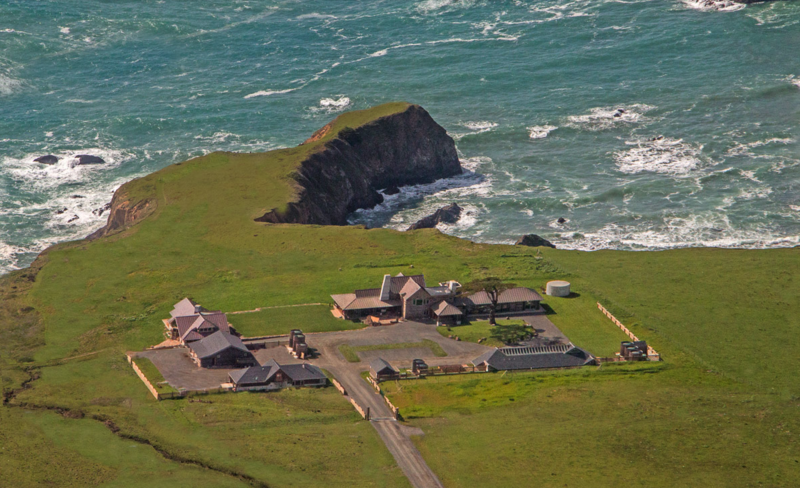 The 2,000-acre working cattle ranch sits directly atop bluffs overlooking the Pacific Ocean. Thoughts of responsibilities and deadlines melt away as the soft, rhythmic sound of waves splashing against cliffs creates a hypnotic sense of serenity – nature’s own 24×7 orchestra. Occasional rumbles of the ‘sea drums’ add a cacophony of deep and soft bass sounds, generated when waves pound into the sea caves below. The property is accessible from Highway 1, marked by the iconic redwood tree at the entrance welcoming visitors. Photos from a century ago show this same tree, essentially unchanged in shape. The ranch was built from 24 individual redwood trees, endemic to the area and representative of the local design style. A duo of Vermont architects designed the property to reflect the harmony of the local environment and its nature. A number of unique architectural elements include a cavernous 20-foot wide stone fireplace, a cathedral ceiling lined by impressive 5-foot wide redwood boards, and a hot tub on top of the water tower, providing sweeping views of the surrounding coastline. 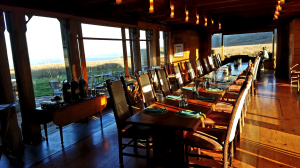 Large glass windows provide inspiring vistas of the surrounding hills, the nearby coastline, the distant Lost Coast wilderness, and stunning sunsets over the ocean. 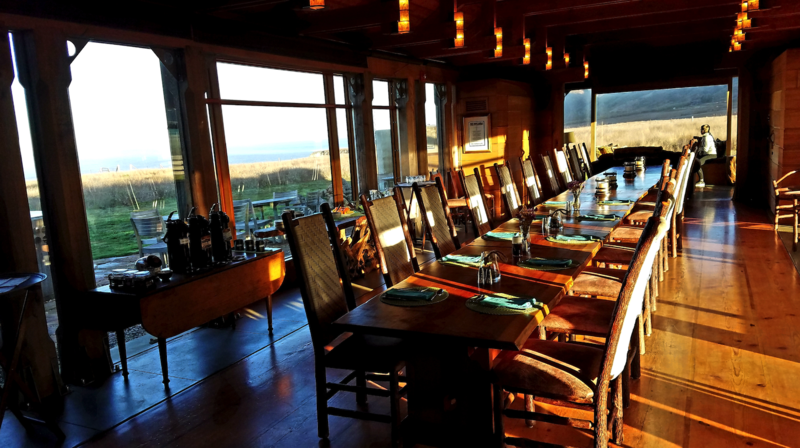 In winter, a favorite guest activity is to enjoy breakfast while watching the abundance of whales feeding just offshore. Due to the depth of the water here, whales have been known to come surprisingly close to the cliffs, providing enchanted visitors the ability to view them up close. The property provides ample opportunity for idle visitors to simply relax, allowing themselves to be inspired by the breath-taking natural beauty of the region. A luxury onsite spa, exquisite cuisine, and evening happy hours featuring fine local wines, extend the ambiance. And for those with a desire to get out into nature, Newport has many options as well. Over 20 miles of trails dot the property, with hand-built benches and picnic tables placed at some of the most romantic locations imaginable. 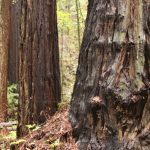 Hikers can choose from a variety of simple to more challenging hikes, strolling through the cattle fields, along the coastal cliffs, up the ridge lines that tower some 1,000 feet above the property, and into the cool and moist redwood forests nearby. Horseback riding along the beach, a guided ATV safari, biking and barbecuing are all available. For those looking to spend some time offsite, there are plenty of activities as well. 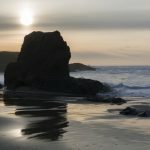 The nearby town of Fort Bragg offers numerous elegant restaurant options, a botanical garden, and one of the world’s top-rated microbreweries. The region is known for its many festivals around the year, celebrating local fauna and flora, from seafood and game to fungi, dairy, and wine. About one mile north of the Inn lies a seaside winery. This unique vineyard allows you to taste the locally grown organic wines while taking in the majestic views of the ocean. Once again, whales tend to congregate just offshore, providing a charming and surreal tone to the experience. 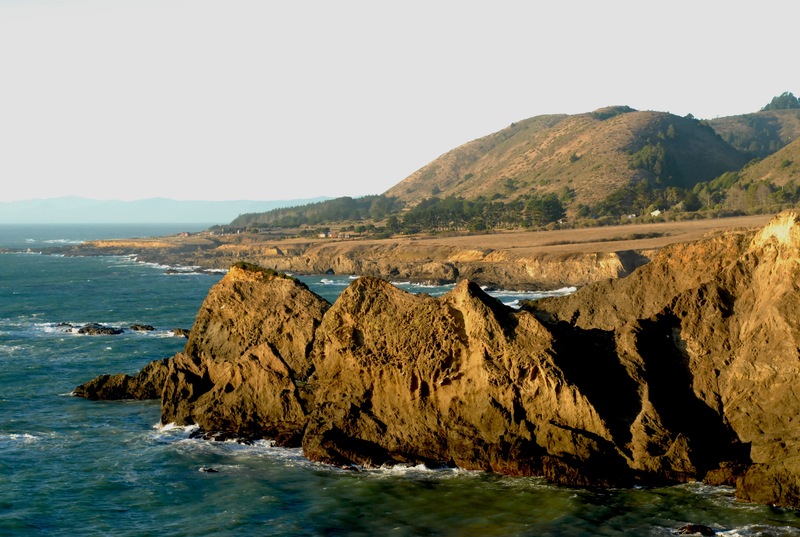 The shoreline of the northern coast, California Highway 1 (Coast Highway or PCH) is barely traveled. For those seeking solitude and scenery, a breath-taking drive awaits. This region was originally inhabited by the Pomo group of natives, whose ancestors migrated here over 10,000 years ago. They enjoyed the bountiful gifts of nature, from plentiful supplies of seafood to abundant wild game and a wide spectrum of flora. Walking the property, one frequently finds crushed shell deposits, evidence of meals eaten by locals in that very same location centuries ago. 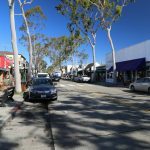 In more modern times, the once thriving lumber town of Newport boasted a lively population of loggers, merchants, and their families. From here, a seemingly endless reserve of redwood trees was loaded onto cargo ships bound for San Francisco. At the time, Newport was the largest settlement on the coast between the Bay Area and Crescent City, just south of the Oregon border. The town eventually ceased to exist as Fort Bragg, some 15 miles to the south, replaced Newport as the main shipping port in the area. Pieces of equipment and faint evidence of housing can still be found throughout the property. 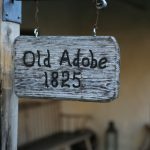 Creating a direct connection with this bit of history, some of the wood used to build the property was milled on the ranch using trees left behind by loggers in the olden days. 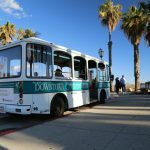 Getting to the Inn at Newport Ranch can be an entire experience in its own right. It is about a 3.5-hour drive from San Francisco. The closest airport is Santa Rosa, only 2.5 hours away. 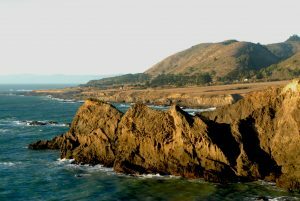 The drive is beautiful, taking one first through the well-known Russian River wine country and then meandering through the beautiful valleys and hills of the Anderson Valley. There are plenty of opportunities to stop for wine tasting, exploring dairy ranches and sampling fruit at one of the many local orchards. The road continues on through the heart of the beautiful Navarro River Redwoods State Park, eventually leading to the stunning Pacific coastline. 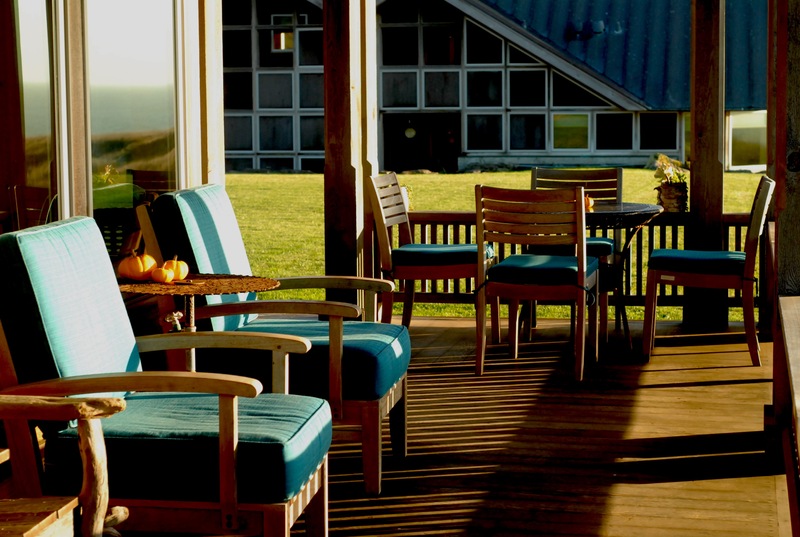 This charming experience is a fantastic prelude to the relaxation that awaits at the Inn. Once visitors arrive, they find themselves unwilling to leave. Many come back time and again to soak up the northern coast. To learn more about how to unwind at this unique property, visit www.theinnatnewportranch.com. Abdul – this looks like a dream!